I rarely see my garden in the same light as others, which I think must be an occupational hazard for anyone in a similar profession to me. Designing for other people is so much easier because you’re not emotionally attached to the space. 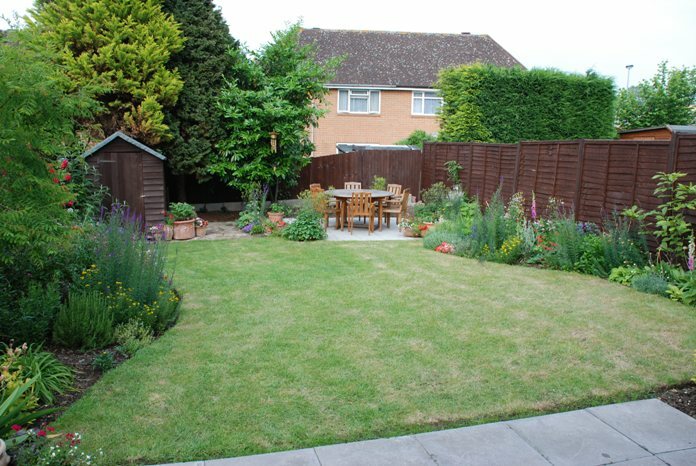 When it comes to my garden, I’m always wondering if we’d done something different would it be better! We’re having our house re-rendered at the moment and yesterday morning I was showing the builder how the garden used to look and this made me realise just how much it has changed since I started to tackle it 8 years ago. I wanted to share this with you as although we did everything ourselves (and we’re far from skilled landscapers! ), I think the pictures really illustrate how different a space can feel if it is designed well. This is how it looked when I moved in 8 years ago…. It was a blank canvass with nothing to inspire. 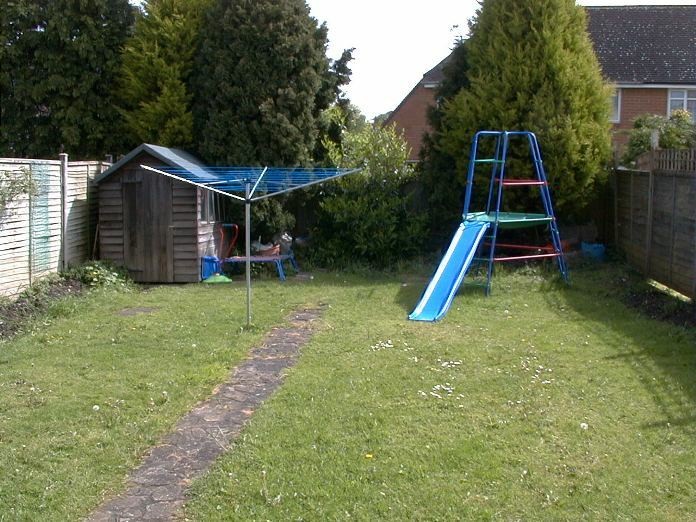 The only points of interest were a washing line, shed and slide providing very unattractive focal points at the end of the garden. 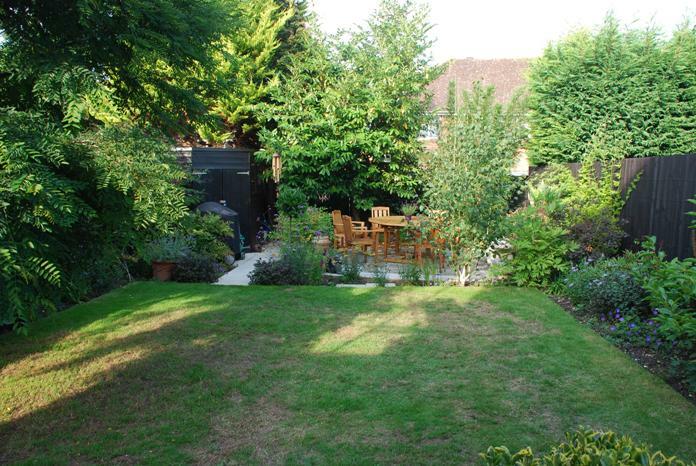 I was desperate to make it into a garden that we wanted to spend time in, but at the time I didn’t really know much about gardening so I set about creating some planting beds and clearing away the rubbish that was hidden under the trees at the end. At the time, I was absolutely thrilled with the result – this is how it looked…..
What stands out for me now is that there was no intrigue, nothing really making you go to the bottom of the garden to have a closer look. I designed the garden from the outside in, thinking about where the planting beds should be and leaving the rest of the space to evolve from that point. 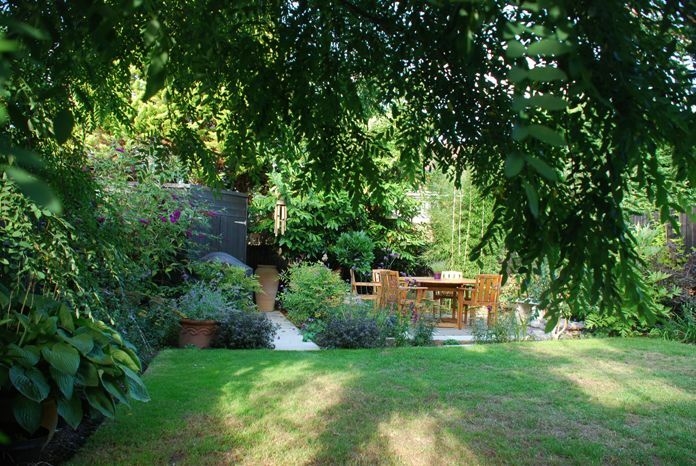 The process of moving the garden to this stage and, at the time, being extremely proud of what I had achieved, was the trigger for me leaving my life as an HR professional and retraining to become a Garden Designer. Learning how to design made me realise that I’d approached my garden project from completely the wrong perspective. Any design should be tackled from the inside out so that the planting beds are the bits that are left over. It’s a little devoid of colour at the moment because the planting needs some time to fill out, but the purpose of this blog is to demonstrate what structure can do to a space (although please ignore the parched lawn!). In essence, by defining the lawn and seating area as two separate spaces I have given the garden more depth and dimension. Now when you walk out of the back door you have an urge to walk down to the end of garden to see what’s there…..and, when you get there, it’s now a pretty great place to sip a glass of something nice!